A living legend, Frank Boon, has done as much as anyone to revive and carry on the old traditions of Lambic brewing in the Senne Valley region around Brussels. Lambic Brouwerij Boon, in Lembeek, Belgium, is a family operation run by Frank, and his sons Jos and Karel. They produce Lambic using ancient methods and have no intention of changing a thing. The brewery dates back to 1680, as a farm-brewery and distillery in the village of Lembeek. In 1860 Louis Paul bought the brewery to brew only lambic and faro. From 1875, he began bottling gueuze lambic. In 1898, Pierre Troch bought the brewery. But after the economic crisis of 1927, it came into the hands of Joseph De Vits. His son, Rene is renowned for the production of soft and fine gueuze lambic. As Rene De Vits had no children, he sold the brewery to Frank Boon. Kriek Boon is a 100% spontaneous fermented beer made from a mix of young and old lambic aged in oak barrels. Real cherries are added, at least 2 pounds per gallon of beer. Whole cherries are mixed with the beer during fermentation for optimal taste. Kriek Boon is a fresh, sweet and sour foaming redish beer with an authentic taste of cherries. 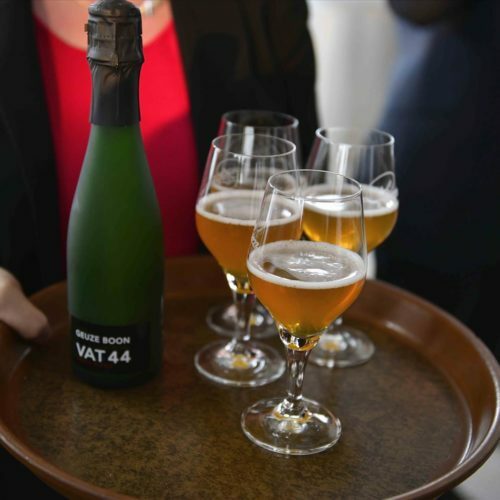 Boon uses champagne cork on the bottles.